Luxurious house, sleeping eight, forms part of an exclusive courtyard development overlooking the world famous Old Course and Swilken Bridge. The spacious lounge / dining room, with views overlooking the Old Course, lends itself to entertaining. For your comfort gas central heating is provided and double glazing keeps the house at a consistent temperature whatever the weather. Private parking for two cars is provided so you can leave your vehicles and stroll around the many attractions of St Andrews. 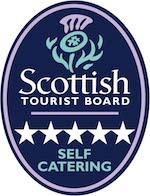 It is an ideal base for golfers and others who wish to explore this very interesting and beautiful part of Scotland. The accommodation comprises of an entrance vestibule leading through to the utility/laundry room with storage for golf clubs and other equipment. This leads into the main hallway where information leaflets are displayed and a telephone is situated. Off the hallway,there are three well appointed twin bedded rooms, one with an ensuite shower room and the other two bedrooms sharing a shower room. There is an attractive mural of Scotland's most famous poet Robert Burns painted onto the wall half way up the stairs leading to the upstairs lounge/dining room, kitchen and en-suite bedroom. For the convenience of the guests there is a security camera/door entry system with visual screen and telephone. 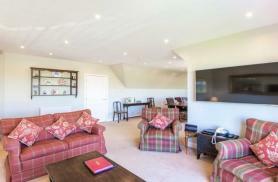 Superb lounge with panoramic views of the Old Course and patio doors to the viewing veranda. This room has very comfortable seating arrangements, a reproduction oak centre table, television and video. The spacious dining area off the lounge has two windows to the north overlooking the Old Course. The dining table, ten chairs, dresser and serving table are made from reproduction oak and are complemented with crystal chandeliers in both areas of the room. Ideal for eating in if guests wish to relax in the comfortable surroundings. The room is accessed from the top landing and has a connecting door through to the kitchen. 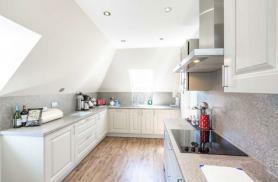 Fully fitted modern antique pine kitchen with fridge, electric hob, extractor, double oven, dishwasher and microwave oven. Doulton crockery for 12 place settings and crystal glasses. Utility Room - With washing machine and freezer. Large cupboard for storing golf clubs, outdoors shoes, etc. 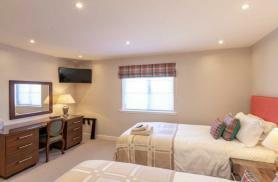 Swilken View has 4 twin bedded rooms, all individually styled but all sharing the highest quality standards. The highest quality pure cotton bed linen and luxurious towels are provided for the comfort of our guests. There is ample storage space throughout all of the bedrooms for your clothing and accessories. The Master Bedroom enjoys spectacular views over St Andrews Old Course. It has a beautiful en-suite shower room. This twin bedded room consists of a double wardrobe, bedside cabinets, dressing table, chairs, and occasional tables with ornate lamps. Attractive south facing twin bedded room with wardrobe, chest of drawers, bedside cabinet, wall lights and table lamp. Attractive west facing twin bedded room with antique walnut beds, wardrobe, chest of drawers and bedside cabinet. Shared Bathroom - Pleasant modern shared bathroom with over bath shower, w.c. and wash-hand basin with shaver point. 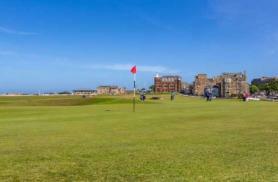 Twin bedded room, also with spectacular views of the Old Course. Attractively decorated modern en-suite shower room with electric shower, w.c. and vanity sink with shaver point. © Copyright 2019 Swilken View. All rights reserved.